SkyBus welcomes companies to advertise on its fleet of buses, through bus wraps or multimedia advertising or to distribute product samples to passengers. Companies that have collaborated with SkyBus include AirAsia, DiGi and Maxis. Below are the types of advertising that companies may opt for. For enquiries please email info [at] skybus.com.my. 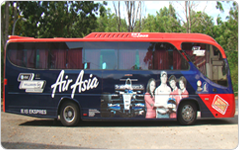 With hundreds of trips monthly between some of the most-visited places in Kuala Lumpur your brand is sure to be seen with the Bus Painting Advertising package. With this package you will receive a bus wrapping custom-tailored for your brand. SkyBus transports over 3,000 passengers on a daily basis, all year round. You can target these passengers with relevant advertising to increase your brand visibility.